Feel Like a Million Kick-Off + Broccoli & Feta Pasta Salad Recipe! Today marks the beginning of the McWane Feel Like a Million challenge! Feel Like a Million is designed to help improve overall health by learning healthy habits to sustain energy for work and play and reduce stress. We are super excited to begin this challenge and wish all of our team members the best of luck! To kick-off this challenge, we want to provide our team members and our social media friends with the recipe for a delicious, yet healthy and power-packed meal, courtesy of Feel Like a Million! This vegetarian pasta salad recipe is perfect for your next potluck or as an easy side dish. The broccoli keeps it nice and crunchy and the chickpeas add protein. For the best flavor, combine the pasta salad with the dressing about 1 hour before serving. To prepare dressing: Mash garlic and salt in a medium bowl with the back of a spoon into a chunky paste. Add buttermilk, mayonnaise, oregano and vinegar; whisk until combined. To prepare pasta salad: Cook pasta in a large pot of boiling water according to package directions. Drain, transfer to a large bowl and let cool. Add broccoli, tomatoes, chickpeas, feta, pepper and the dressing; toss to coat. Cover and refrigerate, without dressing, for up to 1 day. Toss with the dressing about 1 hour before serving. 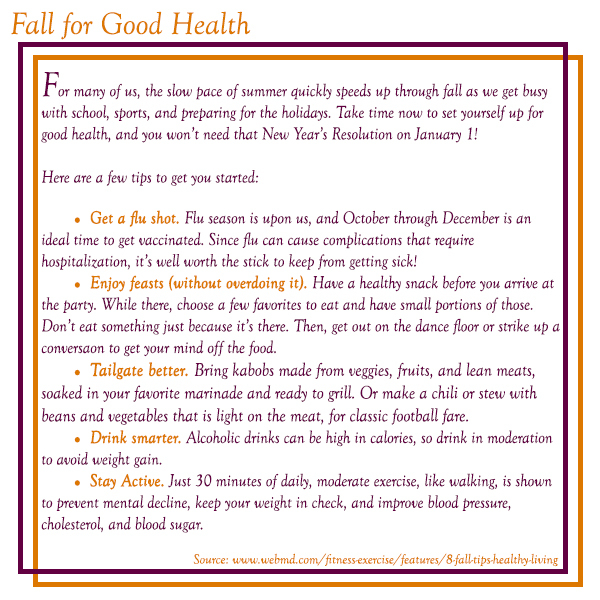 During this fall/winter season, make sure to take proper precautions to ensure that you are in the best health possible! In an ongoing effort to help promote a healthy lifestyle and encourage healthy habits, Atlantic States is holding another Biggest Loser Contest. The contest began on Tuesday, March 4 and will end on Wednesday, September 4, giving participants six months to reach a new healthy weight. The top three Biggest Loser winners will also be given an opportunity to “double their prize”. If they maintain their final weight at the weigh-in on September 4 for an additional six months (March 2015), they will be presented with a second gift card of the same value as their September 4 prize. Being that the contest ends in 3 months, participants are already half-way through! We cannot wait to see the ending results and hope that everyone is doing well on their journey to a healthier lifestyle. Good luck to all participants! Anaco recently held their 5th Annual Health Fair. Team members had convenient access to blood pressure, glucose, and body fat screening as well as a 10 minute massage. Representatives from Kaiser, Dental Health Services, Benefits Resources, and Health Net were available to provide educational materials and answer any questions. 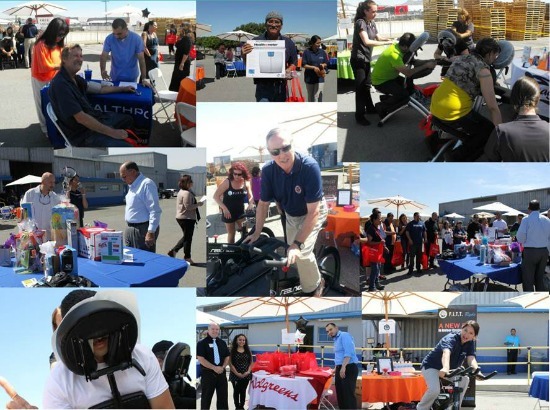 Costco, Walgreens and Fitt Ryde were also on hand to educate the team about how to lead a healthier lifestyle and team members were offered a discount on spinning classes. Anaco provided a box lunch from Subway for all team members that attended the Health Fair and there were also raffle prizes – movie tickets, gift cards to Ralphs and Jamba Juice, a magic bullet, scales, an electric toothbrush, water bottles, a free massage, and membership to spinning class. Everyone seemed to have a great time all while learning more about how to lead a healthier life style. Great job Team Anaco!